For times when music speaks louder than words, we’re introducing “Tune In”, a new series of playlists that will help ground you; inspire you; move you. Here you’ll find your very own soundtracks to blast out while you’re on the road to Changing Worlds. This week we’re going back to our business roots. Tune in to rediscover your passion behind your purpose. The music is here and the time for action is now – here’s to making every business minute count. 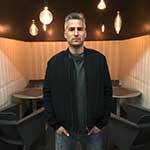 Music Producer Jared Dietch started his career as a music curator for hospitality with over 20 years’ international DJing experience already under his belt. Now the programmer and curator of music for hotels like Thompson, Andaz and W, Jared’s company Music Matters is helping brands develop their identity by bringing background music into the foreground.